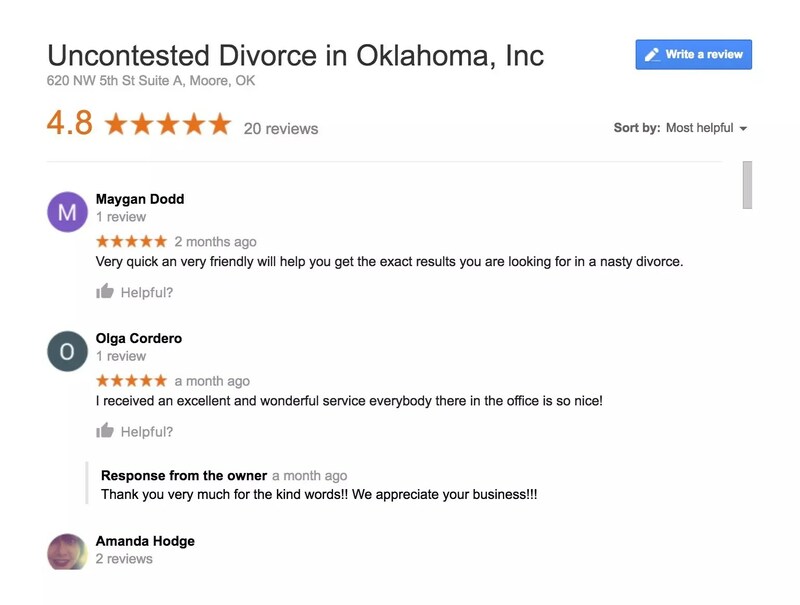 “Get a CHEAP Divorce in Oklahoma! We are HOME of the $149 Divorce! -In office consult is FREE! -We answer all questions you may have! -We walk you through the entire process! Express Documents and Mediation, Inc. a local brick and mortar company can help YOU get divorced in as little as TWO to THREE weeks! We are a mediator divorce firm (non-attorneys)… located in Moore, Oklahoma and are here to serve YOU today! Whether you and your spouse agree or disagree to the divorce… have kids or no kids… have property or debt that need to be divided in the divorce… want to be restored back to your maiden name… we can help YOU! We have THREE (3) primary types of divorces that we can help you with: NOTE: Call us if you are unsure of which option you need! If both you and your spouse agree to the divorce… then you will typically qualify for an Agreed Uncontested Divorce. ➨ An Agreed Uncontested Divorce is one of the easiest… quickest… and most affordable divorces in the state of Oklahoma. We prepare over 2,000 of these a YEAR! ➨ An Agreed Uncontested Divorce needs to be signed by both parties. ➨ An Agreed Uncontested Divorce is typically final & signed by the judge within 2 to 3 weeks after all of the proper paperwork has been filed! ➨ We can prepare your Agreed Uncontested Divorce paperwork starting at only $149 without kids or $249 with kids. We will coach you through the filing process! ➨ Call Us NOW at (405) 259-4248 to Start! If your spouse DOES NOT agree to the divorce… and you know where they are located at… you typically qualify for a Serve Your Spouse Divorce. ➨ A Serve Your Spouse Divorce will need to be filed and served to your spouse at their job or home. ➨ A Serve Your Spouse Divorce ONLY needs to be signed by you. ➨ As long as your spouse doesn’t reply back to the courthouse within 20 days after they are SERVED, a Serve Your Spouse Divorce is typically final & signed by the judge within 30 days with no kids after all of the proper paperwork has been filed! ➨ We can prepare your Serve Your Spouse Divorce paperwork starting at only $199. We will coach you through the filing process as well as the serving process. ➨ NOTE: After your spouse has been served the divorce papers… they have 20 days to respond back to the court. If they don’t respond back, you can finalize your divorce without them. If they do respond back, you will need to go to court. We have attorney relationships on STANDBY ready to assist you if your spouse tries to fight back! If your spouse is missing and you can’t find them in order to get them served or to sign the papers… you typically qualify for what we call a Missing Spouse Divorce… (also known as a Publication Divorce). ➨ A Missing Spouse Divorce will need to be mailed to the last known address of your spouse… and then be published in the Newspaper for at least 3 consecutive weeks. (Wednesday, Wednesday, Wednesday). ➨ A Missing Spouse Divorce ONLY needs to be signed by you. ➨ As long as your spouse doesn’t reply back to the courthouse… a Missing Spouse Divorce is typically final & signed by the judge within 45-60 days without kids after all of the proper paperwork has been filed! ➨ We can prepare your Missing Spouse Divorce paperwork starting at only $299. We will coach you through the filing and publication process! ➨ NOTE: After the publication has ran for 3 consecutive weeks and ended… your spouse will have 20 days to respond back to the court. If they don’t respond back, you can finalize your divorce fairly quick. If they do respond back, you will need to go to court. We have attorney relationships on STANDBY ready to assist you should your spouse fight back! ➨ Call Us NOW at (405) 259-4248 to Start! Our Reputation Speaks for itself! Go to Google and type Express Documents and Mediation Reviews! <<— Click Link to see for yourself! Express Documents and Mediation, Inc.